It is often said that the soul of Bharat is Hindu Dharma. Bharat is an embodiment of a timeless civilization (not an embodiment of a 1400 year old religion). It is the oldest extant civilization on earth today, having an unbroken link going back at least 5000 years, if not much more. Now, all of this is PRECISELY because Bharat is Hindu majority. If this is taken away, then really what difference is there between Bharat and Pakistan? Indeed, if one goes to several Muslim majority enclaves in India today (such as, say, Kashmir valley), then one can see no difference in the thinking, culture, mindset, and values of the people there and those in Pakistan. Put simply, Bharat is Bharat TILL IT IS HINDU. But for how long will that remain? Bharat has many problems, and eventually its progressive Hindus will overcome all of them. But there is one problem HIndus cannot overcome – demographic change. Look at the graphic below. In every state, Muslims are growing significantly faster than Hindus. Their relative population is rising. In 1947, Muslims were 7% of Bharat’s population. In the latest census, that number is doubled at 14% (and that was in 2011; some say the number now is closer to 18%). In other words, in 70 years, Muslims have more than doubled their relative population wrt Hindus. In another 50 years, say they repeat their performance, then Bharat will be 40% Muslim. Now, anyone who has lived in a part of Bharat where Muslims are over 30% knows that the area becomes completely Islamized. Hindus feel pressure in day to day activities; their daughters are harassed on way to school; Hindu women are targeted for conversions; Hindu homes face pressure to vacate and sell their land at below-market prices; Muslim street power manifests openly; Hindu temples start getting desecrated; Hindu festivals face hurdles; There are frequent mob actions aimed at terrorizing Hindus. The list goes on. In 50 years, this will be the state of ALL OF BHARAT! Unless we act NOW. We must act by passing a 2 child bill for all Indians. 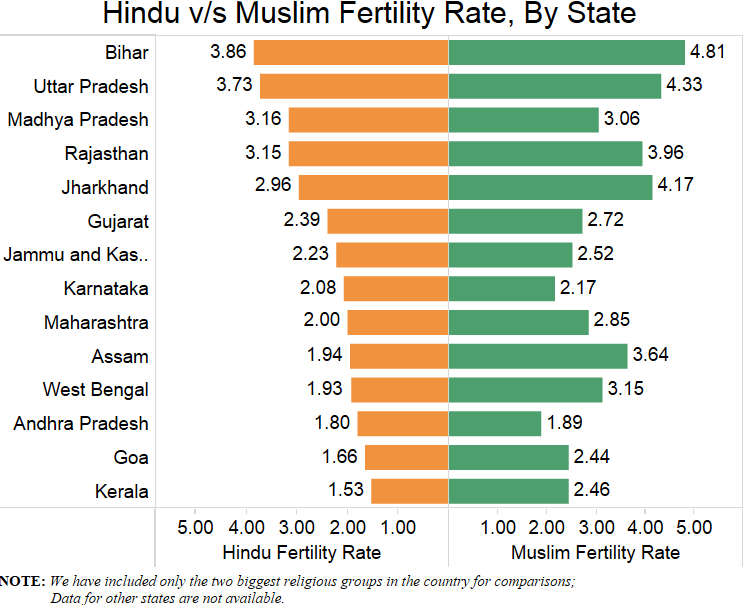 Why must only Hindus bear the burden of family planning, while Muslims grow their numbers and take over space vacated by Hindus? This is cultural suicide. It is the same suicide Europe is committing. Today, in some European cities, the most common name for a newly born male is “Mohammed” because while the migrant Muslims have 7-8 children per family, the Caucasian European has close to 1. We Hindus fought off the Muslim aggression by the sword for over 1000 years. But we are falling into the fatal trap of demographic suicide. UNLESS WE ACT NOW! Please spread awareness of this problem. Make teams, contact your legislators. Demand action on a uniform 2-child bill for all citizens of Bharat. We must act now to save Bharat for our children. Remember, Muslims have no problem living in Hindu majority Bharat, but the other way round is not true. We will simply be hounded out of our own country, unless we act now.